Hair loss has appeared as the most concerning cosmetic problem in the recent years, especially the last two decade. The changed environment due to pollution, food choices, sun exposure and many other reasons like stress, tension and work pressure has increased the risk of this problem. All you need to do is contact a leading Hair Fall Specialist in Delhi. Male Hormone: Males have male hormones which is responsible for hair thinning and baldness in males. Stress: Noted by many experts as one of the most prevalent reasons for hair loss today, stress has a lot to do to your hair. It has been observed that men who lead their life under pressure – work or family, lose their hair early . Protein Deprivation: Yes, your diet has an important role to play in the terms of hair loss. Men, who do not have a proper diet that contains adequate amounts of protein, often have hair loss problems. Outdoor Effect: Excessive sun exposure, pollution, dirt and dust have also their respective roles to play when it comes to hair loss in men. That is why in the metro cities, men have more problem of hair loss than men in rural areas. Genetic Causes: It is noted that genes have also a role in hair loss. Men who have family members with baldness often get it . Alopecia areata: Coin sized patchy hair loss in otherwise healthy people. Scarring alopecia: Patient may complain of itching and burning in scalp. Use of products: Choose your hair products wisely and use them moderately . Depending upon your history and scalp examination, Dr. Nivedita will discuss with you the various treatment option available. 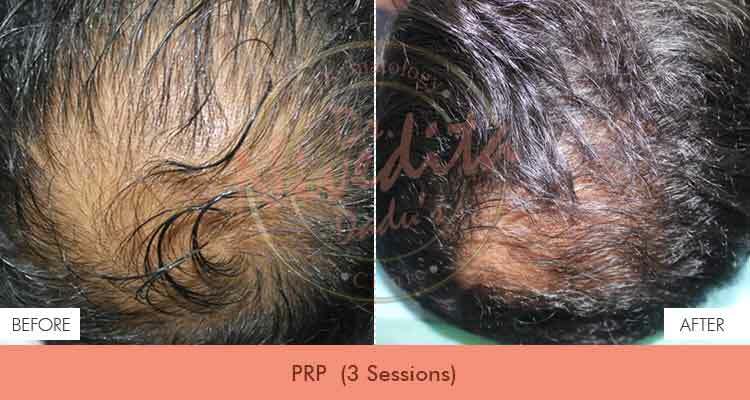 She has a renowned Hair Loss Treatment Clinic in Delhi. Multivitamins for hair fall with oral medication for targeted therapies like anti androgens. Non surgical options like mesotherapy, PRP, hair growth stimulation laser, micro needling, scalp threads. Surgical procedures like hair transplant – F.U.E.